Welcome aboard Mola Mola! 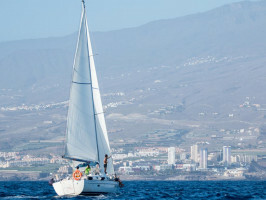 Luxurious sailboats with everything you need to enjoy a unique view of Tenerife, without crowds. Daily departures of 2 or 3 hours where we will be able to meet with dolphins and pilot whales in their natural habitat and snorkel. During the excurison you can enjoy a free snack and bar. 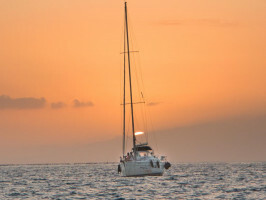 Private excursions of 3 , 6 or 9 hours where you decide what you want to do. During the experience guests enjoy fresh fruit, snacks and a free bar. 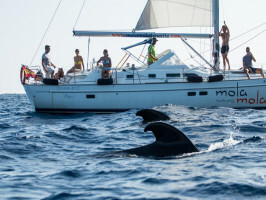 We recommended routes for the sighting of cetaceans or to enjoy the beaches. Our private trips go hand in hand with Möet & Chandon where we present Möet Ice, coctail served with champagne, ice and mint or ginger or fresh fruit. Möet creates a luxurious enviroment for the moment (1 bottle included). Every day at 10am, 11am, 1:15pm, 2:15pm, 4:30pm and 5:30pm. *Molagroups and Molaamanec at 4:30pm and 5:30pm must have at least 4 people. Printed Voucher. Print and bring the voucher to enjoy the activity.. Please choose the correct option according to the location of your hotel when making your reservation, otherwise additional fees may apply. Please call the supplier at least 24 hours in advance to confirm your tour time. -Redeem type: Printed Voucher. Print and bring the voucher to enjoy the activity. - Puerto Colón ,Costa Adeje dock nº1.